"Our Daily Bread Devotional Bible"
Available October 1 from Tyndale House and RBC Ministries is the Our Daily Bread Devotional Bible, which will be released as a New Living Translation. 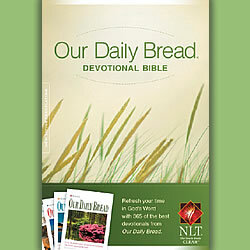 For over 50 years, Our Daily Bread devotionals have touched millions of lives, spanning cultures and generations. For the rst time, 365 of the best-loved readings will appear in this new Bible, each appearing alongside the passage of scripture it addresses. Whether studied by seekers or the spiritually established, the Our Daily Bread Devotional Bible makes it easy for readers to dive into God’s Word and nd deep significance every day.